As title says originally £17.99 then £14.99 now £4.99! Thanks for posting Which store was this in please? Odd as this particular Champagne appears to be exclusive to Tesco? It's the champagne from the French wines promo. If it's £4.99 then grab some! Never seen Lidl discount champers this much. which store was this ? It will be nationwide but as it's to reduce old stock, will be only certain stores that have any stock left. My hubby bought a bottle of this from Lidl last week (not for £5 though! Grrr!) so I guess it's no longer exclusive to Tesco. Buying "champagne" from Lidl. LOL. Imagine. well it's either from the region of "champagne" or not, regardless of which store sells it. I guess from your trolling of lidl posts, you either hate lidl, or wine/champagne. 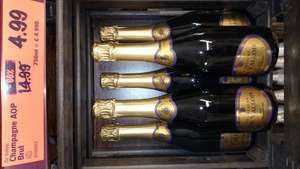 "Lidl’s own champagne Comte de Brismand, which is £12.99, was voted more delicious than Moet & Chandon priced at £32.48"
They've been successfully selling it for a very long time - 15+ years in the UK and longer than that in mainland Europe. Yes, voted by the benefit scum who shop there. Well done you. seems like you've got a lot of hate in your heart. all the best to you. When I go to Lidl the car park is often full of fancy 4x4s and other Germanic metal.I think its irony gone too far with the Polish staff. Because idiots will judge you? Shame I'm in work for 7 and the store nearest my office doesn't open til 8. I might pop over at lunchtime but don't expect there will be any left by then! Why is everyone giving the troll attention? I always buy and keep buying. The appeal of champagne is the label, marketing, feeling of luxury. No one buys champagne for the taste. I got it on Saturday for £14.99, can I return and buy again for £4.99? Just felt the need to repost this as the ignorance is astounding. The appeal of champagne is the label, marketing, feeling of luxury. No … The appeal of champagne is the label, marketing, feeling of luxury. No one buys champagne for the taste. Picked up 72 bottles for a wedding today. Opened one before to taste and its no better or worse than any other and that was warm. When I go to Lidl the car park is often full of fancy 4x4s and other … When I go to Lidl the car park is often full of fancy 4x4s and other Germanic metal.I think its irony gone too far with the Polish staff. Oh yes a nice car means you like nice food that well known association. Personally I find that a lot of people with nice cars would eat anything my boss for one. Oh yes a nice car means you like nice food that well known association. … Oh yes a nice car means you like nice food that well known association. Personally I find that a lot of people with nice cars would eat anything my boss for one. Sorry but that didn't make any sense. Could you turn your brain on and try to write it again? Sorry but that didn't make any sense. Could you turn your brain on and … Sorry but that didn't make any sense. Could you turn your brain on and try to write it again? Quite rude obviously a Lidl shopper. No I'm not going to write it again. Cold. It's not a £5 Cava deal . . . . I can't believe people on here looking down at the likes of lidl aldi etc we r all on this site looking for bargains aren't we? Be it lidl,M&S, curry's, whatever to me a bargain is a bargain voting hot thanks thanks OP. I guess the new world order hasn't reached Lincolnshire yet? Do try to keep up and not look such a ..............................fool! CommentOh yes a nice car means you like nice food that well known … CommentOh yes a nice car means you like nice food that well known association. Personally I find that a lot of people with nice cars would eat anything my boss for one.